Luiz A. Barroso , PhD, has graduate degrees in mathematics, power engineering and operations research. He is technical director at PSR, a Brazilian company that provides mathematical models, R&D and consulting services in the energy area worldwide. He has been actively involved in projects and research on power system economics, stochastic optimization, game theory and energy policy. He has lectured extensively on those topics worldwide, and was a visiting researcher at the Technological Research Institute of the Pontifical University of Comillas in Spain. 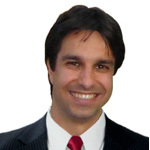 Dr. Barroso is an Editor of the IEEE Transactions on Smart Grids. He is also the vice-chair of the 2011 IEEE PES Conference on Innovative Smart Grid Technologies (ISGT) Latin America and member of the technical committee of the 2012 PES ISGT in the US. He is an IEEE Senior Member and was awarded in 2010 the IEEE PES Outstanding Young Engineer Award.